Steel roll forming machine is a continuous process which coils or strips is fed into groups of rollers. While the coils or strips pass through the rollers, it gradually forms a shape with the desired profile. In the process, only bending takes place and material thickness essentially remains constant. The group of rollers is called stands. And the number of stands maybe 3-5 and up to 28-36 for complex profile. Steel roll forming machine process continious, consists groups of rollers. Steel Roll Forming Machine has many applications in steel industry. And compare with Cutting and Bending Machine, the production capacity is 4 time larger. It save time and labor cost. 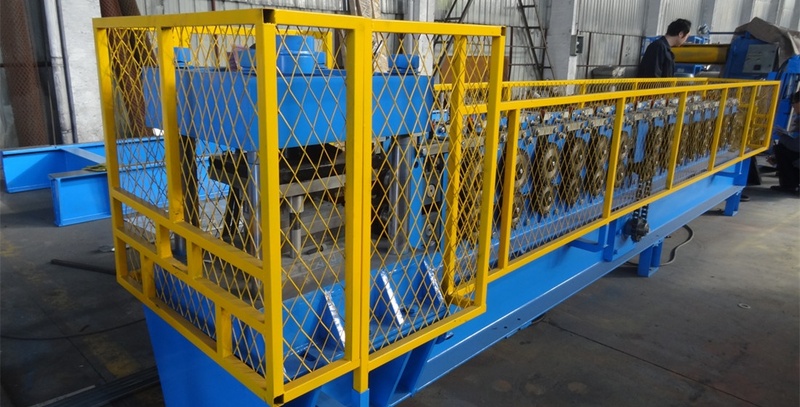 The Steel Roll Forming Machine can produce all the length of profiles by the cutoff blades. The thickness of the steel coil or strips is between 0.18-25mm. And the normal limits are 0.2-3.5mm. Width of the profile is between 10-1250mm. When mass production is involved, steel roll forming machine is very useful. Various components manufactured for construction industry include roofing and wall, purlins, stud and tracks, window and door frames, downspout, etc. And also for pallet racking systems, transportation systems, etc. Believe industry Company have full range of steel roll forming machines for steel profiles. and we also have series kinds of coil process equipments, such as slitting line, cut to length line, blanking line.